Videos About Down Syndrome: Why Does This Site Have So Many? You are here: Home / Resources / Why So Many Videos Of Your Son Born With Down Syndrome? Why So Many Videos Of Your Son Born With Down Syndrome? 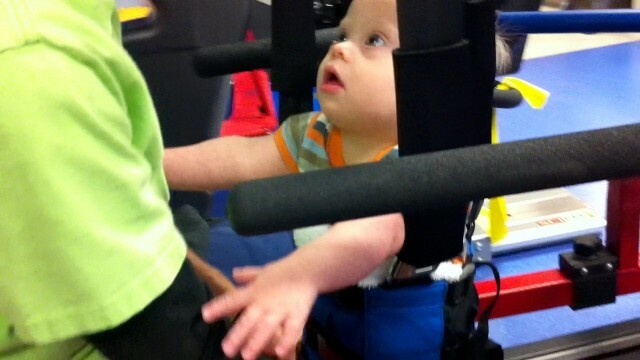 We ‘hang out’ at physical therapy a lot! Why so many therapy videos? Heck, wya so many videos, period? Initially there were two groups of people I really wanted to reach with this website. Group One: I just got a prenatal diagnosis of Down syndrome….now what!? Many of these parents spend countless hours online researching information about down syndrome pregnancy, down syndrome cures, down syndrome causes, down syndrome resources, and all the rest. They are scared. Nervous. Anxious. Confused. But most of all they are hungry to know what it means to have a child with Down syndrome. Hungry to find out what their life will be like if they choose to bring their child to full term? Hungry to find out how different their life will be as a result of their new baby…who just happens to have Down syndrome. In other words; they are hungry to learn what a down syndrome diagnosis means. The second group of people are those parents who (like me) were surprised to learn that their child was born with Down syndrome. When Noah was born I remember spending countless hours in our cold hospital room with my trusty MacBook Air trying to find some videos about Down syndrome. I remember going to YouTube, typing in ‘Down syndrome videos’ or “videos about Down syndrome” (I don’t recommend doing this by the way) and hoping to find 20 bazillion encouraging videos about Down syndrome. In other words it was hard for me to see the tree in light of the forest. The needle in the haystack. The polar bear in the snow storm. Waldo on the beach…Waldo on a ski slope….Waldo at a sports stadium…Waldo at the…..I think you get the idea. Sure, there were lots of great blogs about Down syndrome, but I’m a visual person. I wanted to watch (not read). I wanted videos. I wanted a window into the life of a family raising a child with Down syndrome. I wanted to reach out and touch someone…..sort of. To make a long story short, a few months after bringing Noah home from the hospital I came across a video that encouraged me greatly. After watching that one short video I wanted more. A lot more. But once again I had a difficult time finding them. However, watching that one video reminded me of something very important; the power of story. So I decided to tell ours. I decided I would create for others what I had a hard time finding for myself. Videos. Lots and lots of videos. In fact I would do a video every day (or at least try to.) I would create an online narrative of our son’s life. I would tell his story by posting a daily one minute video of what life is like for a family raising a child born with Down syndrome. My hope was (and still is) to reach the two groups of people mentioned above; parents receiving a prenatal diagnosis of Down syndrome, and parents surprised by a Down syndrome diagnosis after birth. To show them that life goes on. That the rush of emotions fades. That stereotypes are whack. (To new parents: sorry to disappoint you, but despite what you’re about to hear pretty much every day of your life; people with Down syndrome aren’t angels.) That our story isn’t a sad one, it’s a beautiful one. In other words I want to show them the power of our story. Ok…But Why So Why So Many Physical Therapy Videos? 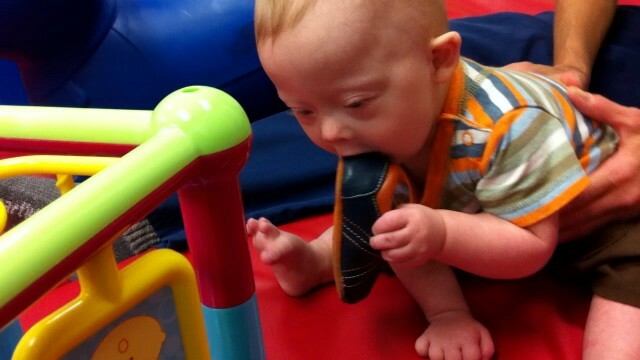 Sometimes he even gets to eat his shoes at physical therapy! Breaks my heart for those families. Reminds me how incredible blessed we are to live in an area with so many resources available to our son. You forgot about the third group! Parents like me who do not have a child with DS, but know someone who does, and through them have been introduced to your site! Who knows which one of us may be the next one who gets the diagnosis while pregnant, or finds out like you did after birth, but either way, our opinion of what it means to raise a child with Down syndrome is NOTHING like the outdated ones we had before actually learning what it means to raise a child with Down syndrome. Just think how many parents will not be scared, because of you and other parents who are so open about raising a child with DS! Thanks so much for leaving your comment, that REALLY means a lot! In fact that’s why I said ‘initially” when I was describing the two groups. But now there are several other groups I want to reach…one being parents like yourself. We are so glad to have you on board. Please feel free to post pictures any time you want. Either on the Facebook wall, or the comments. We love seeing everyone’s little ones. I just wanted to tell you that I enjoy your post and I've been a rehab nurse for over 20 years (sos that makes me old) so I've seen alot of dedicated parents and alot that werent so I'm happy you guyus are there for Noah as from what I can see he is a smart kid with lots of potential. Keep up the good work. I don't blog alot but just wanted you to know you two are great parents. Amy Power ha,ha..I never view anyone's comments as 'rambling' .. I love getting to learn about our readers / friends. 🙂 Thanks for sharing. I LOVE all of your posts, videos, and photos! Thank you so much for sharing! You are touching so many lives in such a positive way…..people that you do not even know and will probably never even meet! How many people can say that about themselves? I was wondering though…have you posted any feeding therapy sessions on here? I have searched your site, but can't seem to find any. Any suggestions? I work as a speech therapist and I thoroughly enjoy watching Noah's daily progress! Thanks…so please….keep them coming! Thanks so much! It's so cool to have a speech therapist following our journey! 🙂 Noah is about to start seeing a private speech therapist here in Dallas that's supposed to be really good, so we are excited. However we do a have a few posts that you maybe interested in seeing. One is his barium sallow study ( http://sweltering-berry.flywheelsites.com/swallow-study/) and if you go to the search box (on the top right) and type in "z-vibe" "beckman" "spoon" "eating from a spoon" you will find some other really ones. I'd be interested in hearing what you think of them. 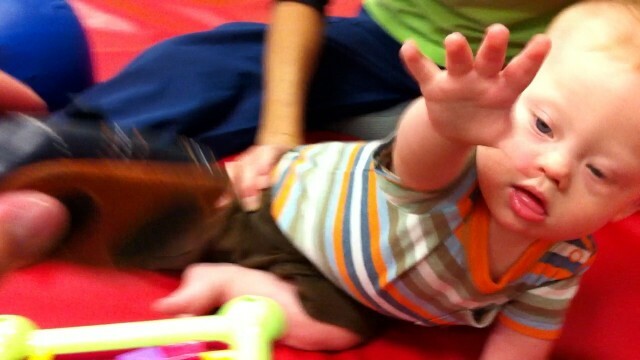 I also have some great videos of him with the speech / feeding therapist that I took before we started the blog. I'll have to find those, and post them for you also. Anything that shares the joy of Down syndrome with others is Fantastic – off course! We love Down syndrome. Thanks Mike! We appreciate all that you do! first off I love your blogs short or long n I love the pictures n videos you do. they not only help the parents out there with ds children but they also help the parents of the children who aren't ds kids. it lets everyone know what goes on in the life of a ds child and the family. maybe the blogs n videos will help some one who was given the news that their child has ds and it will help others to understand that ds kids are just like their child they just have to try a little harder to do some things. you n your wife are blessed to have a sweet loving lil man and to share him with the world is great and to want to help others only shows what kind of parents noah has god gave you noah for a reason n I think that reason was to help others get thru their days n life with a ds child and know that they are not alone. thank you for sharing your family with us and please keep up the great job you do. noah is a very lucky little boy and you n your wife are very lucky as well god bless you all. Thank you so much for your kind words, and encourgment. I really appreciate them! I just love watching Noah's therapy sessions. It gives me ideas to do at home. Oliver has PT twice a week and OT once a week, but they come into our home. Which is fabulous, but I wish he had access to some of the equipment they use with Noah. Like the treadmill and harness. But we are lucky to have the services we do have. It was hard at first because Oliver cried during it, so I cried, his big sister cried and told them to stop hurting her brother, it was tough. But now he smiles and waves and talks to them. They become part of the family. Since having Oliver our family definately became larger, we now have a pediatrician, cardiologist, thereapist, and many nurses in our extended family. Keep the video's coming, we learn so much from them. But most importantly we know we are not alone! @Beth: My son cries every time he goes to PT with one certain therapist (he works with two in the week). As a matter of fact, he DIDN'T cry for the first time on Tuesday, and you can better believe I took video! Turns out my little man likes techno music, and that therapist has techno music on his phone. Who would've guessed?? I agree with you about his "team" becoming a part of the family! Lydia Norvell How old is your little guy? Oliver is 20 mths and it was about 4 mths ago he finally stopped crying for all of them. It was one in particular he cried for. It was actually kind of funny, she wouldn't even talk or anything and he knew she was here and he would look at her and cry. now they are friends. Oliver had his 2nd heart surgery over Christmas, so he couldn't do therapy for awhile, so I was worried we would start over with the crying when it started back up, but he didn't. He was a champ. That is great about music, Oliver likes any music, his little feet just go and go. Beth Sheehan James is 17 months…so there's hope! I'm happy to hear that someone else's child didn't just love it, and that he outgrew it! I'm hoping James will, too. Thanks for the encouragement. Lydia Norvell He will, keep me posted. I would love to hear how it goes! So much was going through my head reading this post. But the one line that just stopped me dead in my tracks was this one. It makes me insane to think that people cannot get the simple , (and PT for our children when they are little is simple), help they need. The simple exercises that will strengthen their muscles, the simple ways to adjust your hands to help them , help themselves to climb, or sit up or pull to standing. it’s not right! it’s not fair! I agree. That’s what I was thinking also. It breaks my heart that there are so many people who don’t have access to even some very basic therapy. I’ve actually been brain storming / talking with people about some ways to help some of these people. You wouldn’t believe the number of people who write in that have the same story. It keeps me up at night. I looked up Down Syndrome on You Tube and yes I found ridiculous stuff and a few touching videos. When I searched on regular search engines I found a group on babycenter and I found your blog. I remember saving it under my favorites because it looked awesome and full of information. I worked with teenage kids with Ds, but I had no idea what to expect with a baby. I was mostly looking for info on how to help James and what to expect with development. Wow, thanks Amy. I really appreciate the kind words. What sorts of things did you type into Google when you are searching? This also helps me to think about what sort of resources I should work on to help other parents. I was hanging out with some other parents this weekend, and asked them the same question. It seems several people searched for "down syndrome cure" and "is there a cure for down syndrome." I found that interesting. Like Libby Holmes, I didn't do any searching. Someone sent me a link to Kelle Hampton's blog, and I kinda stuck with that. But I was really wishing she would put more information on her blog. I would try to decipher her photos and words to figure out what Nella was achieving and how. Then a friend in the DFW area heard your story about the Target post, and she sent it on to me. It contained exactly the answers I was looking for. We have a blog for our kids, and I know what kind of work you're putting into this! I'm trying to do better about videos I put up–taking your cue and including "child with Down syndrome" in the description, and tagging with "Down syndrome" so the videos are more readily available to people who are looking. There are several people here who keep blogs. Maybe one day you could give us a post on the simple things we could do to make our blogs/videos more search engine friendly. By the way, it's been about a week since I started the Facebook comments. What do you think? Do you like them? Is it easy? Pros? Cons? NoahsDad.com : I'm not sure about the FB comments, yet. I like that it connects to your page on FB, but it seems that the posts people put directly on FB aren't making it over here? So the conversation is still disjointed. And then there's the second comment section at the bottom of the page using Disqus, so I have to remember to scroll down there and read those comments, as well. I don't think I get notifications of any comments this post gets (where I used to get e-mails because I subscribed to the post). Hm…in looking, I see that I could still subscribe at the bottom of the page. I wonder if I would just get the Disqus comments in that subscription, or the FB posts as well. I'll have to try it. So…all in all, it's fine, I'm just not sure it solves the problem of connecting the two sites to create one conversation. Maybe I'm missing something? I'm sure you have a very large list of things you'd like to accomplish! I'd like to say I was a tech-nerd, being a Mac person, a designer and photographer, and hey, a Gen-Xer, but I'm not. Otherwise I'd offer to do that post for you. I do know how to start a blog. 🙂 Anyway, I'm sure you've thought of it, but it might be a good time to start having some guest bloggers! You keep up with the Noah's Minute and other things close to your heart, and let others tackle some things that you want done, but may not want to spend the time doing. This is a large community; surely there are many varied talents here! I'd be happy to help any way I can. Lydia Norvell By the way, have you tried to 'follow post' yet…? I'm curious what that does. Lydia Norvell actually I just followed this one. 🙂 Time to see what it's all about. I do not have a child with down syndrome, but I love and follow your blog and your facebook page. We did have a special daughter, Arayah Hope, who was born with neurofibromatosis. Arayah had epilepsy due to her nf1 and passed away suddenly last Jan at the age of 9. We miss our special girl, (we are the parents of 7), and are praying about adopting a child with special needs, (i.e down syndrome). Keep doing what you are doing. Dianna, I am so sorry to hear about Araya. She sounds like an amazing girl. How old area ll your children? And do all of your children have special needs? When you said you were the parents of 7, I didn’t know if that meant 7 special needs children. You are succeeding. Keep up the good work. Hi Rick. I am actually one of Noah´s fans who live outside the US. We are from Costa Rica and we currently live in Dominican Republic ( lucky us to live in two vacations spots!!). When Felipe was born ( in Costa Rica) we got the diagnosis there. All the medical staff were so possitive and encouraging. We never got the "I am sorry to let you know your boy was born with DS.." No, never, our Pediatrician was very positive letting us know that DS is not what used to be, that Felipe should be raised as any other kid but including all the therapies required to help him accomplish more things sooner. Anyhow, I was devastated by the news. I search the internet and I got so furious because my doctor was lying to me: based on my research in the web, Down syndrome was a curse, was something awful happening to us. Why was the doctor lying to us? Well, now Felipe is 6 months old and he is doing great. The doctors were right. However, the web is full of discouraging information or misinformation. Besides the therapies we got to put together here in Dominican Republic ( most families here use the Doman Method from the Institute for Acchievement of Human Potential which I don´t like at all), Felipe has a preety normal life so do us. That is why I have found your blog so inspiring and helpful. It really shows what a down syndrome looks like and what is life with a down child. I just love it! Everyday I get urged to see what Noah is doing! I am very excited about him as I am about Felipe! Thanks for that. You should try a reality show! You do not post too many videos. You don't post enough! What a wonderful insight into your life with Noah. I so wish things like this would have been available years ago. Of course, there was not the technology then, but I wish parents could have seen that having a child with DS is not necessarily a bad or sad thing. Thanks for all you do for other parents. And thanks to Noah for just being so cute. Hi Rick! We live in Arkansas and have limited resources. Our baby is 6 months old. We watch your videos to see what we should be doing to build Jacobs strength. He watches them with me 🙂 thanks for sharing!! Emily, I know what you mean about limited resources, especially where we live! Shannon McAllister Hunter Do you live in Arkansas? What are some of the resources you have found helpful? I'm also interested in learning, and helping others find access to information. How old if your child by the way? Sounds good Shannon! We will talk soon! Rick…Jacob has not started any therapy. He had open heart surgery at 3 months old and had to recover from that. Now we are having a developmental evaluation done Thursday and the let the games begin! He is doing great! @Emily Turner: We live in South Arkansas…about 2 hours from ANYwhere, but have been blessed with a great place called Hope Landing. Our developmental therapist (not connected to Hope Landing) has been coming to the house since before James's heart surgery (at 3.5 months old). We didn't start the rest until he was about a year. Things didn't really get going until after surgery, that's for sure! Glad your little man is doing so well! Lydia Norvell Is Hope Landing a private therapist? Or is it through ECI? It sounds like you guys had a great experience. NoahsDad.com Yes, Hope Landing is private. They bill Medicaid or private insurance, but make it very clear from the beginning that their clients should not feel pressured to pay beyond their means. It is faith-based, and was started only 5 or 6 years ago by several therapists who were frustrated by the limitations of center-based and hospital-based therapies (what was currently offered in our area). They offer PT/OT/ST, as well as family activities (fishing, fall fest, etc.) and some Parents Night Out kinds of things. It's a very cool place. I often say, had we known James's diagnosis before we moved away from Fort Worth to here, we would NOT have taken the job here and moved, but God had a better plan for us! I never would have guessed! Lydia Norvell Wow, that does sound like an awesome place! 1st off.. I think its odd I can sort comments by "social ranking" ooodddddd. I love the blog and videos. This whole site and FB community is so…uplifting. resourceful. inspirational.WONDERFUL. I, like you , had NO idea that my child would have DS. It was a tough thing to hear. I was too young, healthy and well that just would not happen to us. BOY, was I wrong and I am honestly so glad I was.. He is a blessing and I know it. Fortunately, from the get go we had a supportive group of people around us – social workers, nurses, doctors, BUDS. They were very incouraging. I find it so so so sad to hear the stories like yours where there were no resources and you only recieved an "I'm sorry." We must change that! MUST! Your videos and blog are great. Even though we have the resources available it gives us a quick peep into things we haven't experienced yet. It gives us a "heads-up" and points out things we need to be proactive about, ask questions about, watch for. And honestly, it just makes me happy. Keep on..keeping on! Also I didn't google anything. I was scared to ' google '. also, I like to share your posts as a way to share info with curious family and friends. A lot of people dont know how or what to ask. We have nurse friends who admitted to not knowing much about DS even tho they were fresh out of RN school. Its important to give people the opportunity to learn about DS. Caleigh Crow Thanks so much for your comment. You guys sound like you are really rocking it! I also hope that people come here to learn more about Down syndrome, who don't have any children with Down syndrome…so thank you for passing it along to your friends / family when you see fit. Keep up the great work, and keep sharing your story with us. We are all so glad to be on this journey with you. Rob, thanks for your comment. I couldn’t get your link to work, would you mind reposting it? In regard to the daily videos being a bit much, I guess it’s personal opinion. I would have enjoyed seeing someones story being told minute by minute, day by day when Noah was born. I knew nothing about Down syndrome, and would have watched every one of them. But that’s just me…I’m strange. 🙂 Also, that’s a great thing about the internet, people that want to check them out every day can, and people don’t, don’t have to. Me on the other hand, I’m always looking to do things that haven’t been done before. When Noah was born I knew there were a ton of blogs (many of them great, many of them not so great…not updated in months and months, only have 1 or 2 posts on them, or like @Lynda:disqus I mentioned above, didn’t have much information about Down syndrome. And that’s what I wanted. I wanted to know how the family was feeling, thinking, what their life was like.) So…I knew my writing wasn’t good enough to stand out in the sea of a million blogs, so I decided to do something different, videos. By the way, I agree with you, it’s their interests (and the interests of others) we’re in this for. (Trust me, there’s not a lot of material reward in it for me for all the time I spend writing, editing pictures, videos, and creating content for this blog.) This entire site is for others, it’s what keeps me going. Our son and his present (and future) feelings about what we share on this site are very important to us, which is way we are extremely intentional about what we share. And as he gets older, we’ll continue to evaluate and rethink how we are spending our time, energy, and resources…and what is thoughts are on what we’re doing. I found your web site and then your facebook site when all the publicity came out a couple of weeks ago about the little boy in the Target ad. I am not the parent of a Down syndrome chid, but I am empathetic to those who are. We have a couple of exceptional children in my own family and I know many parents of autistic and down syndrome children. I had my last two children at an older age and I was at high risk for a down sysdrome birth. I did not have the amnio tests done in either case, because it would have made no difference to me if my child was "normal" or otherwie. So many in our society are so quick to throw away a child like this who can become such a blessing in our lives. I think this website and facebook page are wonderful because they show a realistic idea of what parents with down syndrome children face each day – I am certain it has been, and will continue to be, a blessing to those children and to future children. ALL children have value. Noah is blessed to have you as parents and you are blessed to have him. I am sure you have even saved some children's lives by what you are doing, if the parent has seen this website before making the decision to terminate their pregnancy (kill their child). God bless you and your family always! We didn’t find out Joseph had DS until he was 3 months old (long story) so it definately was a shocker. I googled a lot once we found out, mainly finding very saddening stories so I am happy to find this page because our story is a happy one and our biggest message to anyone and everyone is: there is nothing to be sad about. Joseph is one the happiest people on Earth. You can’t be sad around him. Thank you for having this website!! How old is John now by the way, and how is he doing? As a father with two adopted "special needs" children myself, I know you can never have too many videos of your children! Keep it at, dad! Charles Specht Thanks for sharing this! I can't wait to check it out. NoahsDad.com We have five children. Our oldest three are biological and the youngest two are biologicla siblings from China. But we didn't know they were siblings when we adopted the first one (Charlotte). It's a great story. Luke is our youngest. They both have eye problems. Charlotte can see really well, but Luke is blind. They're awesome. We love them. Adoption is so good! I actually wrote about adoption on my blog. Check it out some time. I just found out that a friend via the web is on a Mommy group with a women who is a surrogate. She's currently 20 weeks along and just found out that the baby has chromosomal abnormalities. The "birth parents" want the surrogate to abort the baby! My heart aches for that baby and the surrogate mom who is now fighting with them because she is refusing to abort. What would you say to these "parents" to help change their minds and can you please pray for this family and the surrogate mother, she's so broken up right now. Thank you! They cant make her, can they? Thanks for seeing the need to educate. I hope you continue to blog over the years, so that I can see the development and growth of Noah. It is exciting to see his curiosity come out so naturally, like any child his age! I will be sharing this blog with my colleagues, in hopes that they will in turn, share it with their parents at a younger age. You may have a bigger impact than you can imagine at this point and time. Rick, I wish that my husband and I had something like this to see when our son Tyler was born 3 1/2 years ago. We were lucky enough to have a supportive family and genetic counsellor who only asked once if we wanted to continue the pregnancy and didn't keep asking after we said yes. She provided great information as well and thankfully I found a couple of good sites including one called "BabyCenter" which has a great group for those who need support regarding a child, family member or friend with Down Syndrome. California really does a great job at providing for kids with Down Syndrome. My husband and I were 21 years old when TJ was born. I had an amnio done to test for a inheritable genetic skin disorder and we were shocked to find out at 17w that he had Down Syndrome (and later that he did have the skin disorder). We thought we were too young for a baby with down syndrome but the genetic counsellor gave us great info. The only way I found good information online was by typing in "Down Syndrome Pregnancy", "Down Syndrome Support groups" and other similar things. What I wanted was information on what we were facing both health wise as well as developmentally and I found some information but didn't really get to see how our kids with DS have so many differences and no two are exactly alike (as with all children), or enough supportive information. I really just found alot of information about abortion, termination, etc. and much of the information I read was outdated and info from doctors did not show very positive experiences, only all the negatives that can occur with DS. We went through a premature birth, open heart surgery at 10w old, rare but severe complications that kept him in the hospital (on a vent part of the time) for 3 months and although he never used a bottle again he's healthy and doing GREAT catching up. Thanks so much for sharing all of that with us. I'm not sure if you are on our Facebook page, but we'd love for you to post some pictures of Tyler! (http://facebook.com/noahsdadcom) everyone there really enjoys pictures. 🙂 By the way, I'm glad you found our site, we really enjoy learning about everyone's families. This was a great post! We were the exact same way. First we got the diagnosis and had no clue what to think. Even our genetics doctor asked us NOT to go online and research. But eventually, after a few days, we were starving for more information. You were one of the links we came across. We can’t tell you how great it is to have you guys post these blog posts (long or short). We have been following you for a long time as you know. We do plan on meeting you and having our boys have a playdate! You also know we use you guys as a guide to let us know what we can expect from Enzo in the future and it’s AWESOME! My favorite thing? I love it when friends, family, and even strangers recommend that I follow Noah’s Dad. I love hearing people tell me they are following you guys and then recommending it to us. I also love sharing with them that we have been followers for so long.